Gah, sorry about making you guys wait an extra week for this page. Had a bunch of stuff kinda happen all in one week there. Bad timing! Website moving hosts/boyfriend’s birthday/threw my back out. Who cares, bad excuses. Anyway, hey, a new scene! New colors! Outside! Fancy domes! Boy, Amarillo is a lot larger and more bustlin’ in this alternate future. They’ve been driving for a WHILE, I guess. See, they’re in Texas’s panhandle now, so they’ve been driving for at least six hours… I think? Maybe less. Yay, update! Yay, you feel better! Yay, new site! And how adorable is Marcus? I swear, he’s the cutest abomination I have ever seen. Keep it up, I love how you drew this scene. Aaarh, Marcus! We all love you! aww marcus is the cutest!!! Holy cow! Look at those clouds! Look at that ground and shadows! Look at the overall color palette! BEAUTIFUL job on this page, Beck!!! I’ve seen this sort of lighting before in real life, and you’ve captured it perfectly! *__* Thanks so much for the link! Wow, this is the first good look we get at the outside world. Amazing first panel, you really get a sense of the destruction that must have rolled through that area. Aw man he’s so cute. And your backgrounds are utter WOW. And you drew a car so I am superwayimpressed anyway. There’s one thing that threw me out of mimesis, and that was Delia saying “Aw, man.” It just doesn’t sound like the character you’ve established (to my ear). But then there was that cute panel of Marcus and it’s all good now. Yeah, actually, you’re right. Perhaps I should change that to something else. like… ‘oh dear’ or something. I don’t know. She’s been in the states long enough to pick up our slang, but still. I know the slang that carries with you most your life is the stuff you lean when you’re a kid. BEAUTIFUL DARLING. The colors are great, and little Marcus is cute as usual. Though, sometimes I imagine him with a masculin voice… Then I guess it wouldn’t be that cute… But anyway, great job with this page~ Looked great on twitter, made me even happier to see here! I don’t care if it’s all irradiated and deadly in this history, the way you draw this area of the US makes me want to move there. Oh, it probably doesn’t look that different. Just with more scrub trees in real life. Nice to see some new scenery, Beckey. I’m magically intranced by the wonders of the landscape. It gives me the feeling that Marcus has been bugging Delia somewhat to her ever-loving last nerve, and it is hot and stuffy in that car. The air conditioning probably doesn’t work if there is any in it, and the back seats could fry an egg if you laid one on there even though it’s only November. Yeah, if it’s anything like my old 70’s car the air conditioning most definitely doesn’t work. November in Texas’s panhandle is probably pretty cold, though. They get blizzards that far north! Cool, now we might get more history about this timeline. 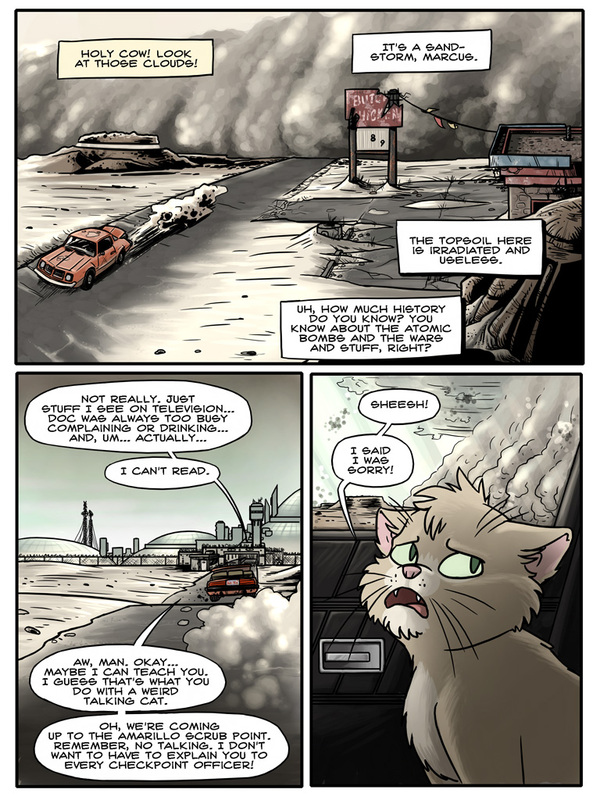 The beat up car is a good touch to go with the wastelands, but who does the car belong to? Is it Doc’s? It’s Delia’s car. Doctor Schtein actually never learned to drive, so he doesn’t own a car. Neither did Zack, and he’s still the amusing genius person. *Bones nerd* So why would Schtein need to drive? He doesn’t. S’why he never learned. The cat made me squee! Awww Marcus! Aww, how has she gotten Marcus to her possession? Awww, nobody can stay mad at a face like that–or even mildly annoyed! By the way, great job with the coloring and the backgrounds! I keep going back to look at the panels, and every time I do I notice something new and amazing. Awwwwwwwww, cute Marcus. The best drawing of him yet! Whoa, the sandstorm looks so real. Good job on that. And I’m interested to hear about these atomic bombs and wars and stuff as well. Marcus has a beeeeeaaaaarrrrd. :3= Heehee. I like the new Amarillo. The cloud’s awesome. I like the colours of entire strip. I was shooting for a real page for saturday, but I forgot I had some family obligations to go to. I am so in love with your colors. And with this comic. And yes, for some reason I go back and keep re-reading the archives. Also, you are very good at body languages, and I like how you experiment with angles and viewpoints. It doesn’t fall for the trap of being too static and filled with talking heads. I can’t wait for you tod raw an actual fight scene! I am now FINALLY caught up. What led me to the comic is actually the picture used for verification when voting on TWC. I was voting for another comic when Schtein (that how you spell it?) popped up. After I clicked the correct button I clicked on the “Want more of Schtein?” link, and here I am!